With NIRScout, you can measure fNIRS from anywhere on the head concurrently with (nearly) any other modality. It is our most versatile solution for fNIRS researchers. measurements on any subject, for any application. Request a quote or get more information on NIRScout. Connection to the NIRScout systems is quick and easy, with 'thumbscrew-style' probe connectors (shown right). Optimize your NIRScout system with the precise configuration for your research. NIRx has been actively involved, as a company or through our internal researchers, in advancing NIRS hardware, software, and methodology for the past 30 years. We dedicate 100% of our company to selling, supporting, and advancing NIRS. We offer the highest-level scientific support to our customers, ensuring that the nuances of fNIRS are fully appreciated. You can learn more about NIRx support on our support page. Freely-configurable probe arrays easily integrate with EEG and tDCS within a single NIRx NIRScap. 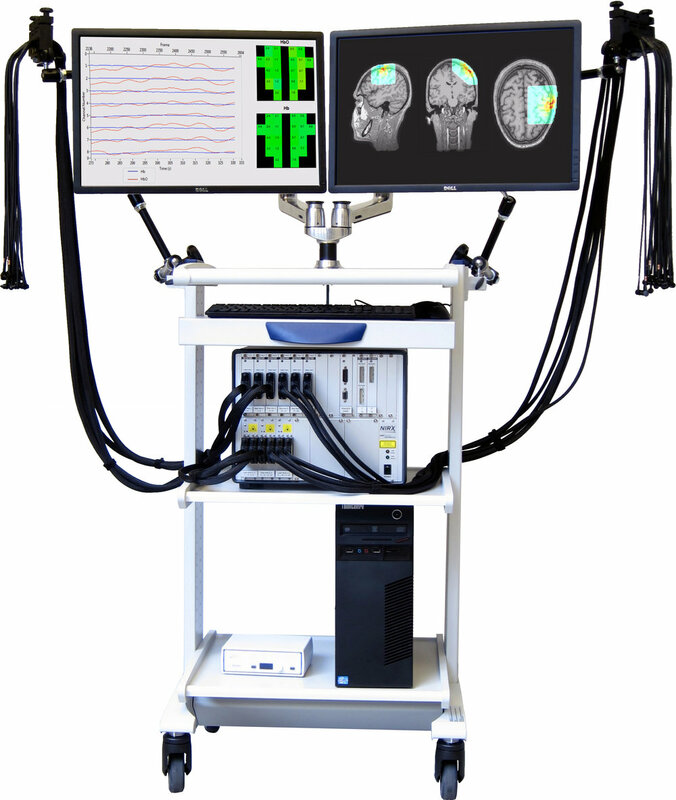 Right: NIRScap integration with passive EEG electrodes and NIRScout NIRS 'optodes' (i.e., NIRS source and detector probes). NIRx can easily integrate with nearly any EEG electrode for concurrent NIRS/EEG measurements. Integration with passive unshielded, passive shielded, active, and sponge electrode solutions all exist for NIRScout and NIRScap. Data integration with NIRScout and EEG systems is easy with event synchronization. This may be done at the start and end of experiments, during 'trigger' events, or arbitrarily during the experiment. Example Right: The event trigger generated by the presentation computer is sent to the digital interface (trigger splitter), where the events are then sent to the NIRx trigger splitter box, splitting each trigger and maintaining the proper voltage, sending the even signal to the NIRS and EEG systems. This trigger-splitting method may be used from different input devices (e.g., TMS, eye-tracking, etc. ), and sent to multiple recording devices. The NIRScout is excellent for multi-subject (hyperscanning measurements), especially for social and developmental applications. Movement-related noise is minimized by the innovative NIRScap and probe design. Many NIRScout end-users process their NIRScout data in real-time for brain-computer interface (BCI) and neurofeedback applications. The diagram below is an abstraction of both neurofeedback and BCI data flow. a) BCI-based application - controlling a software program, robot, etc. b) Neurofeedback, influencing the subject, thereby altering the physiological signals (ideally). Feedback are typically visual, audible, or haptic. Topography Software Open format: nirsLAB, Homer2, MATLAB, etc.